The National Gallery of Modern Art and the India-Bhutan Foundation present Bhutan: An Eye to History. The camera, it has been said, is the eye of history, and this exhibition documents the early photographic records of the Himalayan kingdom of Bhutan, and the close ties of friendship and co-operation between India and Bhutan since the historic treaty of 1949. 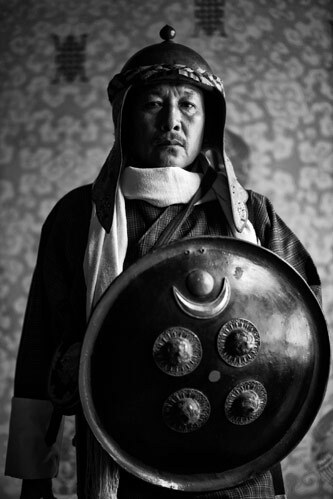 The collection also has a premiere showing of the remarkable photographic work of His Majesty Jigme Khesar Namgyel Wangchuck, the King of Bhutan. Intensive research for this exhibition from several private archives also yielded surprise photographic data. A distinct section deals with the history of photography in Bhutan, showcasing rare pictures from the nineteenth and early twentieth century. These images, recording the British Mission headed by the Hon. Ashley Eden to Bhutan in 1864 have never been displayed before. 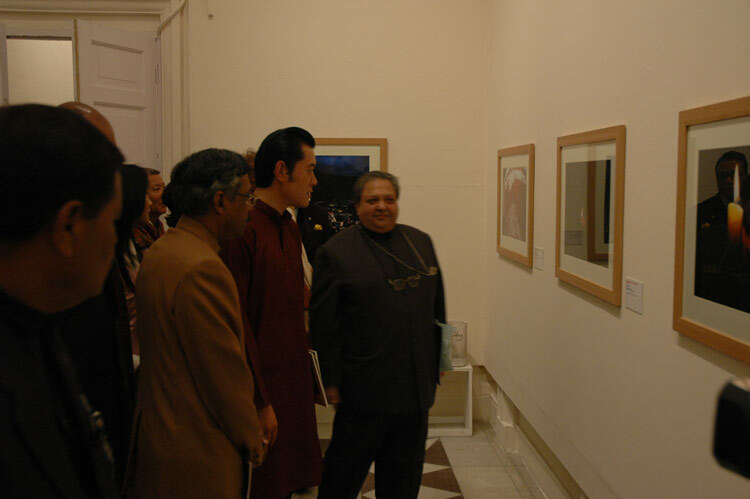 Photographs of His Majesty Ugyen Wangchuck, the first King of Bhutan’s visit to Calcutta in 1905 and to attend the Delhi Durbar of 1911 are amongst important archival photographs being exhibited for the first time. The use of the photographic image to create a national narrative has several parallels across the world, but to include friends of the nation in this narrative seems to have been enthusiastically imbibed by successive generations of photographers, both in India and Bhutan. 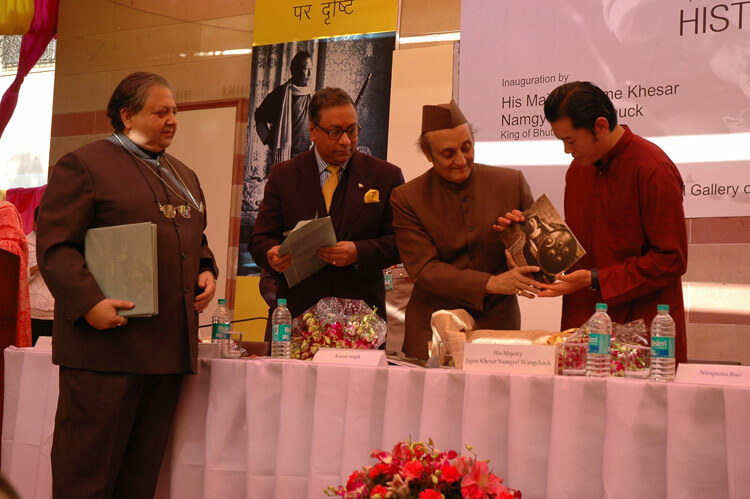 This collection focuses closely upon the visits of political leaders from India to Bhutan and the reciprocal journeys made by Bhutanese leaders to India. The selection of images looks at the genre of documentary and press photographs and the slot created by them in the official narrative of nations. The democratizing lens of the camera goes on to capture Bhutan as it steps into the new century and is increasingly visible as the newest entrant to the world’s democracies. 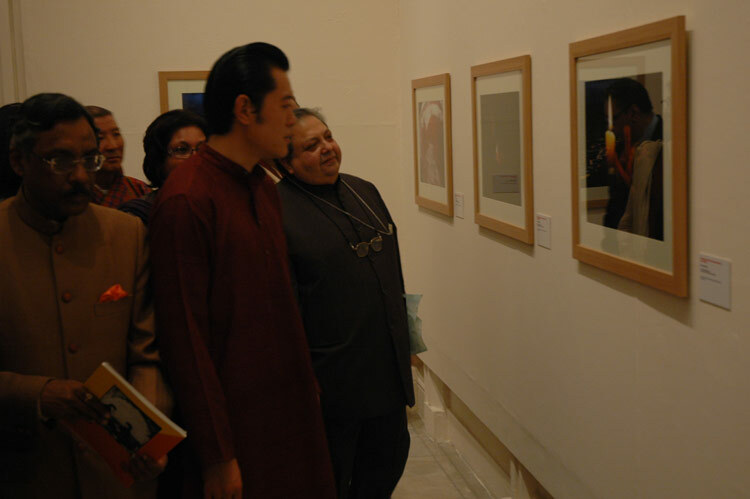 The final section displays the debut photographic oeuvre of His Majesty the King of Bhutan. Popularly known as the People’s King, His Majesty Jigme Khesar Namgyel Wangchuck has traversed the length and breadth of his country, often by foot. His photographs are both an objective record and personal testimony of his empathy and engagement with his nation. Bhutan remains an idyll, and these transparent pictures are not airbrushed with sentimentality or morphed to disguise lurking shadows. The exhibition has been curated by Pramod Kumar KG, with support from Lily Wangchhuk and Namita Gokhale. The India Bhutan Foundation, co-chaired by Pavan K. Varma, Indian Ambassador to Bhutan, and General V. Namgyal, Bhutanese Ambassador to India, has extended invaluable support. 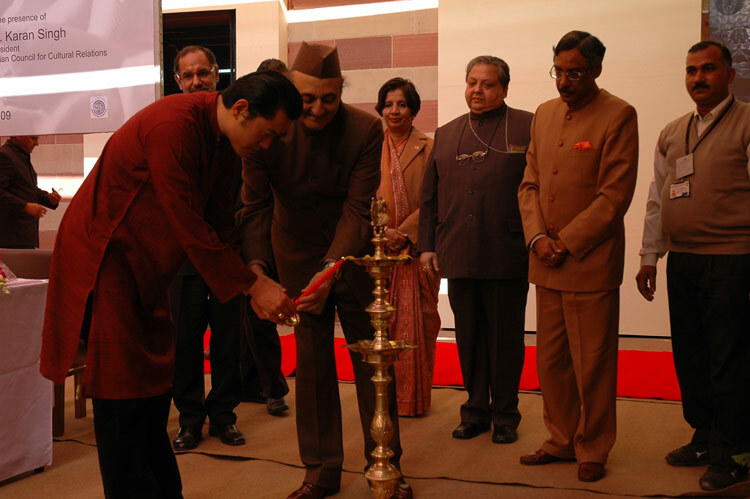 As has the Public Diplomacy Division, Ministry of External Affairs, Government of India. 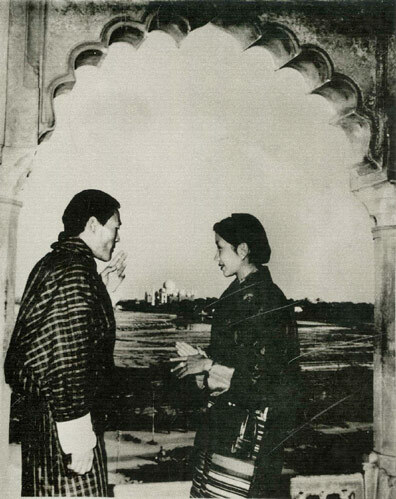 His Majesty Jigme Dorji Wangchuck & Queen Ashi Kesang Choeden Wangchuk facing the Taj Mahal, Agra 1954. 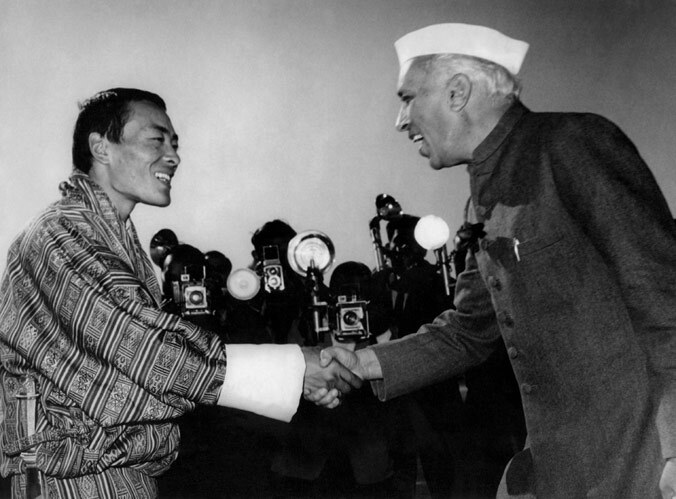 His Majesty Jigme Dorji Wangchuck the third king of Bhutan and Prime Minister Jawaharlal Nehru at Delhi in 1954. 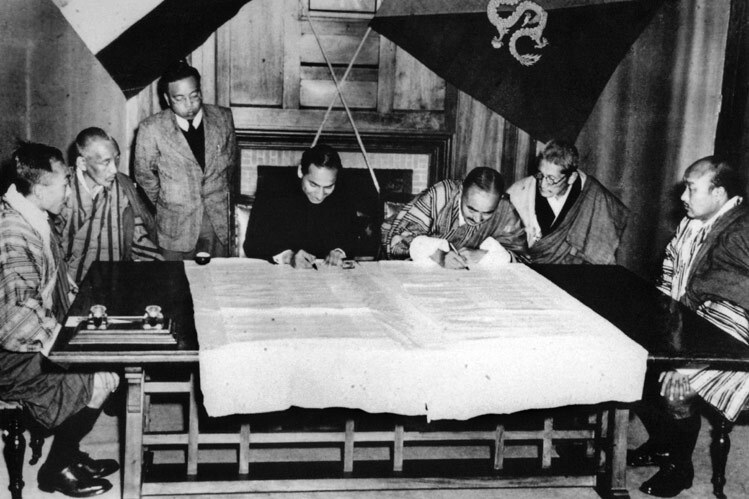 Signing of the first Indo-Bhutan Friendship treaty at Darjeeling on the 8th of August 1949. Sri Harishwar Dayal, representing India, and Gongzim Sonam Tobgye Dorji representing Bhutan, signed the treaty. Prime Minister Manmohan Singh and His Majesty Jigme Khesar Namgyel Wangchuck at the Tashichhodzong, Thimphu, 2008. 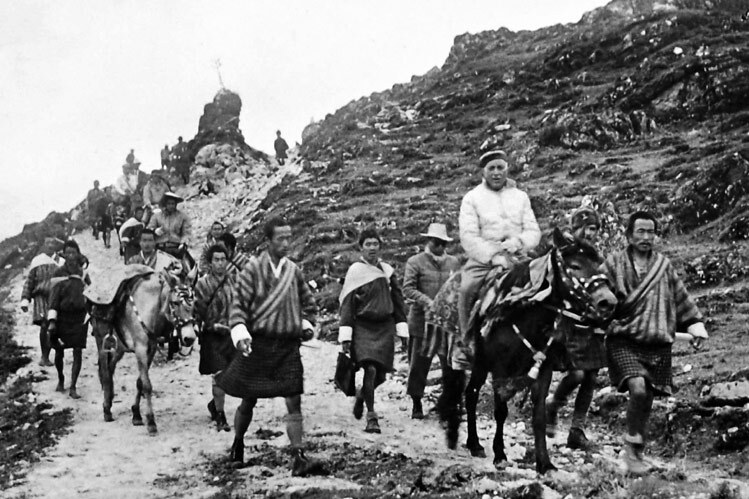 First King Ugyen Wangchuck of Bhutan with the British Political agent for Sikkim, Tibet and Bhutan (centre) with the King of Sikkim at Calcutta. c. 1905. 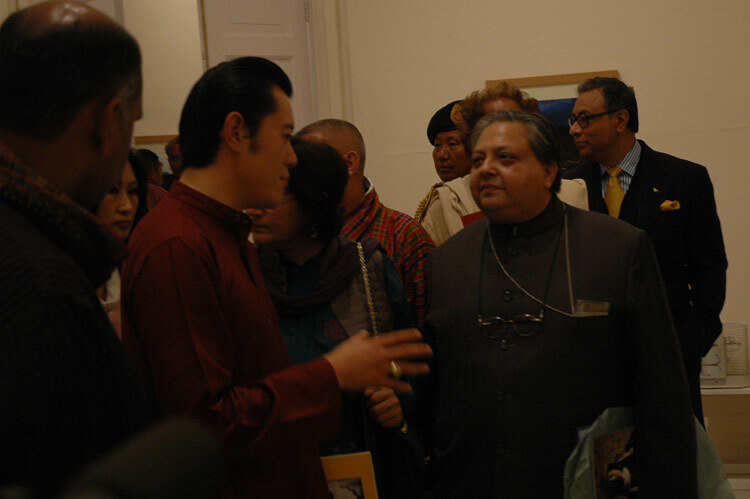 His Majesty Jigme Khesar Namgyel Wangchuck King of Bhutan has kindly consented to inaugurate the Exhibition in the presence of Dr. Karan Singh President, Indian Council for Cultural Relations at NGMA Jaipur House, India Gate, New Delhi.